UPDATE: The Fort Collins Coloradoan printed an article on us today! This is what’s called good publicity. WHAT MOST OF YOU ALREADY KNOW: Exploding Goldfish Films recently wrapped principal photography on a full-length feature film with the inscrutable working title of Untitled Search for God, written by Ethan Holbrook and directed by Andrew Gingerich. WHAT MOST OF YOU DON’T KNOW: What the movie is about. John Porter (Sean Cummings) is an ordinary guy with an ordinary life and an ordinary house and an ordinary job, until he discovers that his girlfriend Fran (Rosalie Robinson) has been keeping severed heads in the trunk of her car. She claims that the heads were removed from vampires. Meanwhile, John’s best friend Richy (Andy Mitchell), a crooked accountant, has just embezzled twenty thousand dollars from the Mob and is now being hunted down by mob boss Antony (Richard Ney) and his goons, Gus (Andrew Gingerich) and Reggie (Mikhail Twarogowski). IS Fran a vigilante vampire hunter, or just a psychotic serial murderer? WILL Richy escape certain death at the hands of vicious organized criminals? WHAT have people been hearing out in the woods? AND WHAT OF the man in a dog suit with a God complex (Vincent Gagnepain) who keeps tormenting John? Check back in the summer of 2008 to find out! I could sit here and write a few thousand more words about why this movie is so cool, but instead I think I’ll just show you a quick clip. Keep in mind that this is a rough cut with a very rough sound mix, but it should give you a good idea of what the movie will be like. This is the beginning of the movie, in which we first meet Richy, John and Fran. Enjoy! Also don’t forget that it’s starring the handsomest man alive. George Clooney. As th voice. I forgot to tell you guys I got him booked. Mr. Ney (should I get in the habit of dropping the “Mr.”?) does really, really well and I wouldn’t have guessed. Good stuff. Who is this person who does the music? It sounds very appropriate. MY DADDY DOES THE MUSIC, PAUL PERSON!!! A couple things: first, let me make it clear that this is a bit of a fragment of a rough cut, and as such is subject to change without notice. I tried breaking up the Mob scene because I felt that the gunshot gave us a perfect break to introduce John and Fran, as well as raising the stakes on the question of Richy’s survival. I’m quite happy with the way it turned out, as is Ethan, and the plan is to move forward and iron out any kinks with that pacing in place. Also, hate to break it to you, Paul, but the bus pass line will not be in the final cut. Sorry. It just doesn’t fit the piece. 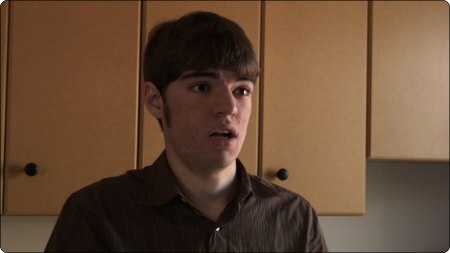 Finally, I am proud to report that since Monday, Ethan and I have completed a rough cut of the first quarter of the film. That’s a lot of editing, and we’re still going strong. In fact, I’m going back to editing as soon as I post this long-winded comment. WOO! Hmmm. Alright, well I’ve talked to Ethan, and in the end it’s up to you. I still think it’s rather fragmented and we really don’t care what happens to Richy and we don’t see what this has to do with everything, and we have no idea what’s happening and why we should care. I understand the fragmented argument, but this is an early enough cut that I have faith it will improve. Pity about the bus pass line, but I agree it didn’t really fit. I would say most definitely, because I’m involved in that sort of thing…because I’m an actor and the world obviously revolves around me. Speaking of whcih, I’m handsome. Me me me. I’m a narcississtic fool! Blah blah blah. I keep meaning to ask: is this still a working title, or is it one that is likely to be the final title? Working title. WORKING title. This is a working title. NOT the final title. Yeah. Andrew keep telling yourself that. Mwahahha. Ha. Working title. Right. Right. Just like the movie which SHALL NOT BE NAMED HERE had a working title. I think I just had a mild seizure. P.S. Congrats on the article! I love how the writer ended it (not). No, it really is a working title. Otherwise I will personally sneak into Andrew’s house the moemnt before the final take is made and give it another title, like “Rememberance” or “I was a teenage Vampire Hunter” or “Dog: A Story of Redemption”. Awesome, can’t wait for the whole thing! I know. We shall call it: Harry Potter and the Half-Blood Prince. …For the premiere, at least. And then Andrew and Ethan would be mauled by angry teenagers everywhere. But still, Publicity. Is there something wrong with that Arin? I don’t have a problem with Andrew and Ethan being mauled, do you?